Connecting in Philadelphia on a trip on American Airlines. My inbound flight was from San Francisco and this time my outbound flight will go to Amsterdam. Usually, at the end of the year, I go to Germany. American Airlines has direct flights from Philadelphia to Munich. It is the only direct flight on American Airlines which will go to Munich. I had to make this small detour because I booked, as usual, last minute and I wanted to make sure that my Systemwide-Upgrades will be confirmed at the time of booking. Otherwise, I would be on a waitlist and worst case would be ending up in Economy Class. With the stop in Amsterdam, I at least got a confirmed Business Class seat on the international segment on this trip. During booking, the agent was unable to confirm the upgrade to First Class on my flight from San Francisco to Philadelphia, but a few days before this segment got upgraded as well. My inbound plane arrived at the C-Gates and I would fly out of the A-Gates. 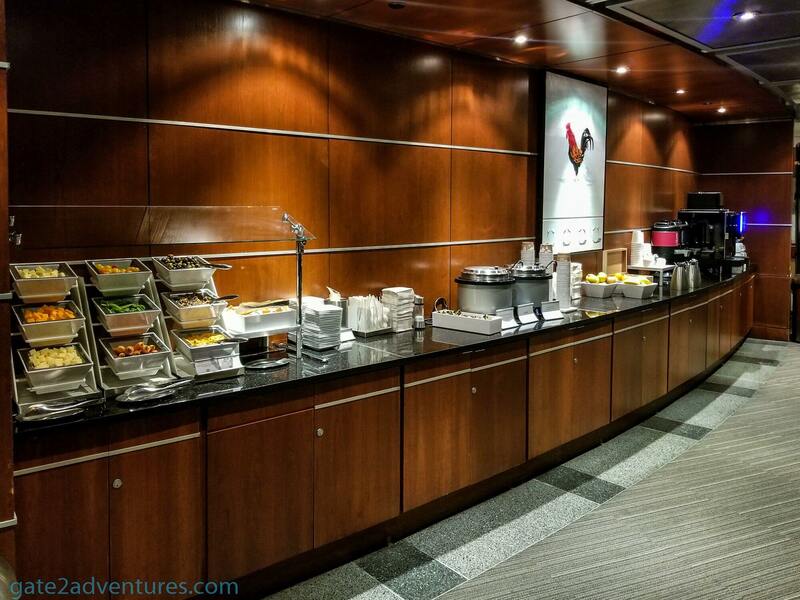 I wanted to use an Admirals Club, the Philadelphia airport has 3 of them, close to my departure gate. 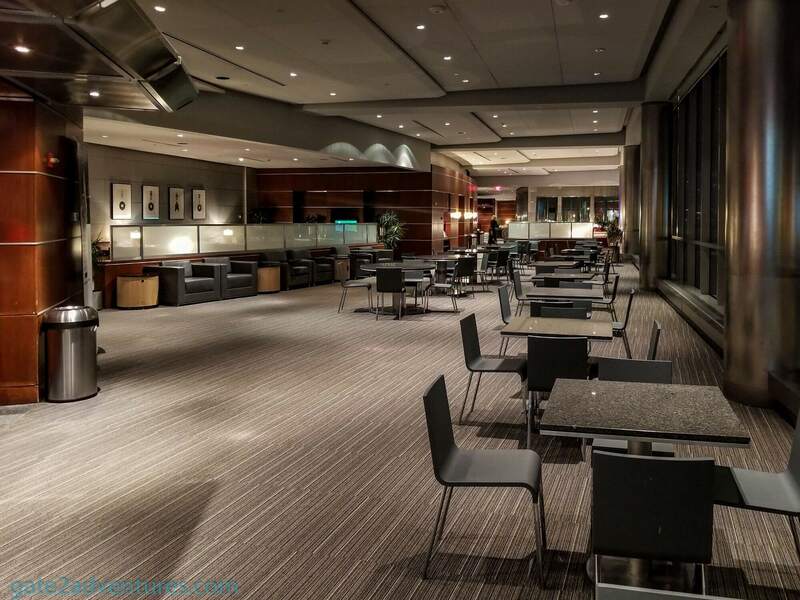 This would be the Admirals Club located on the mezzanine level between the Gates A15 and A16. On my way, I passed the British Airways Lounge, which I reviewed a few years back. 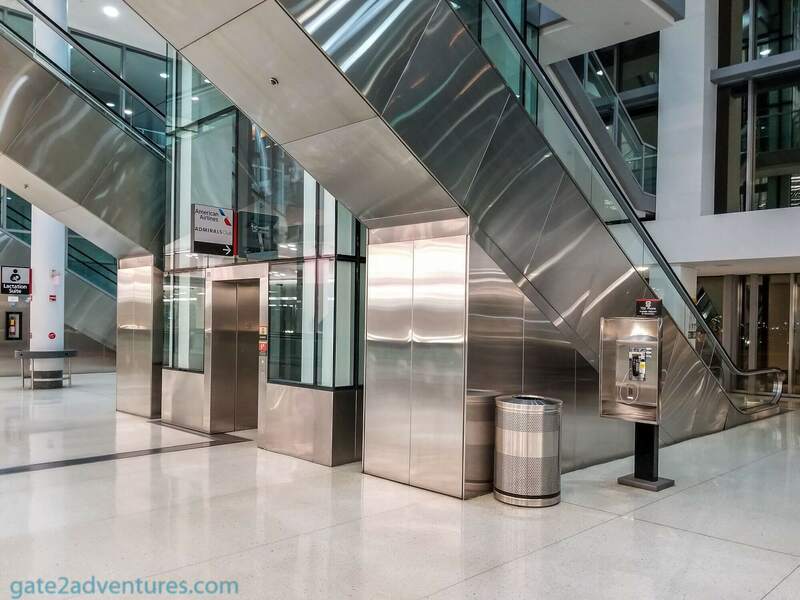 In A West terminal, mezzanine level between Gates A15 and A16. First and Business Class passengers traveling to Asia, Australia, Central America, Europe, Mexico City (MEX), New Zealand, South America (First Class Passengers are allowed one guest) marketed and operated by American Airlines or a oneworld® airline. AAdvantage® Executive Platinum, Platinum Pro, and Platinum elites traveling to Asia, Australia, Central America, Europe, Mexico City (MEX), New Zealand, South America (one guest permitted) marketed and operated by American Airlines or a oneworld® airline (regardless of cabin). 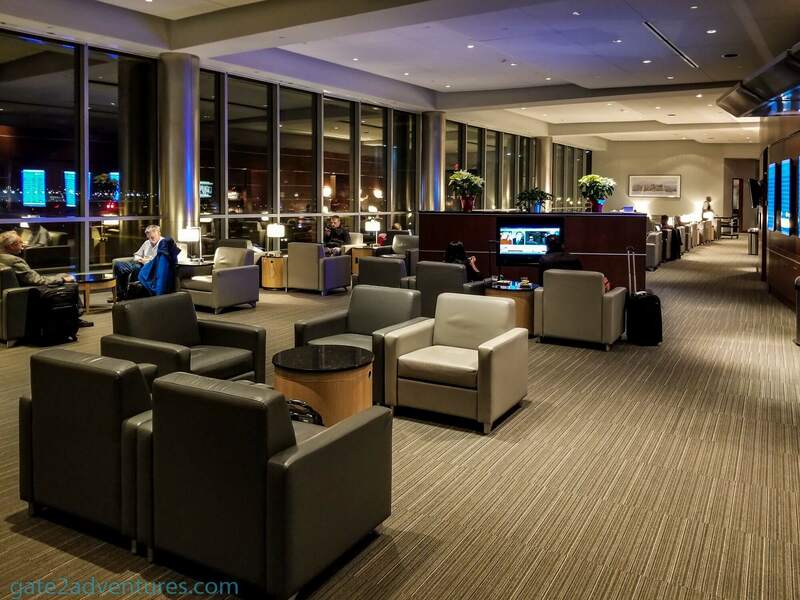 ConciergeKey members departing on or connecting to any flight marketed and operated by American Airlines or a oneworld® airline (regardless of cabin). Immediate family (spouse, domestic partner and/or children under 18) or up to 2 guests. 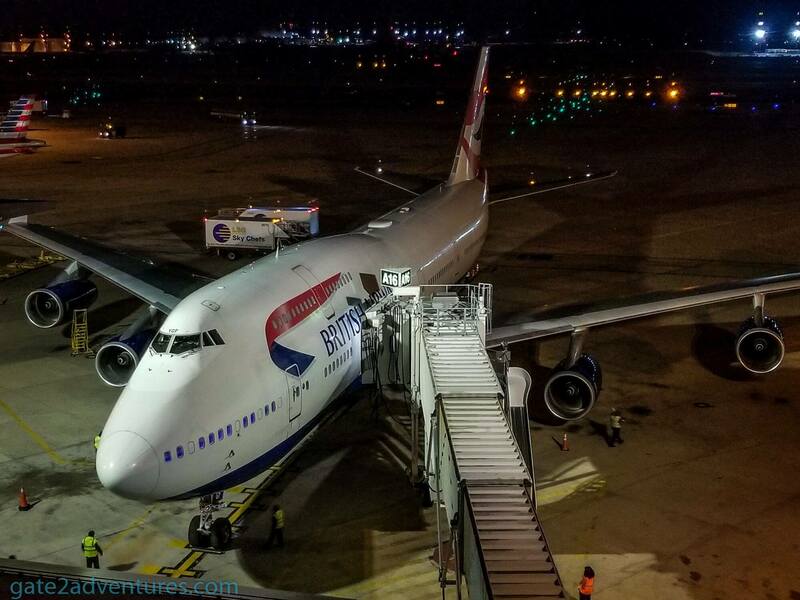 oneworld® Emerald and Sapphire elites departing on or connecting to any flight marketed and operated by American Airlines or a oneworld® airline (regardless of cabin). One guest permitted. 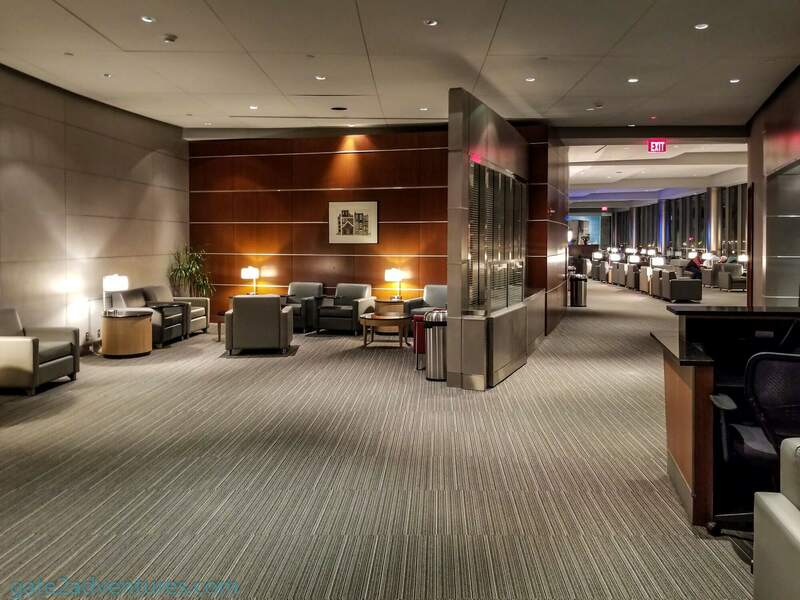 Admirals Club Membership: A membership can be bought with money or miles and discounts are available depending on your Frequent Flier Status with American Airlines. 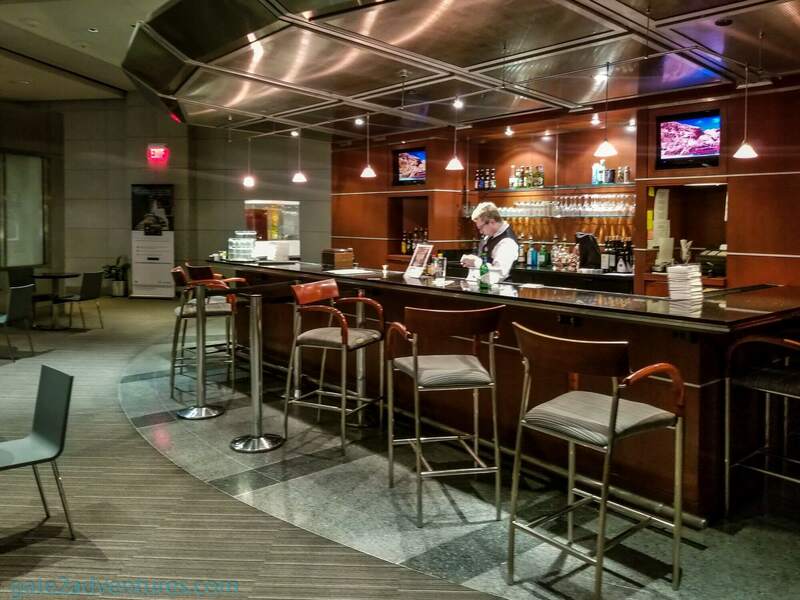 Check the Admirals Club website. 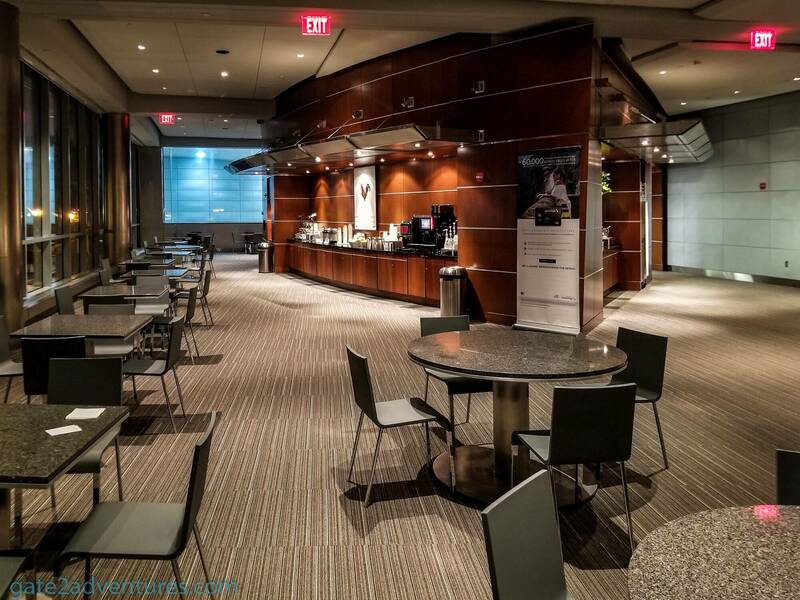 Admirals Club Day Pass: A day pass can be purchased directly on-site. Military: U.S. military personnel traveling in uniform traveling on a same-day flight operated by American. 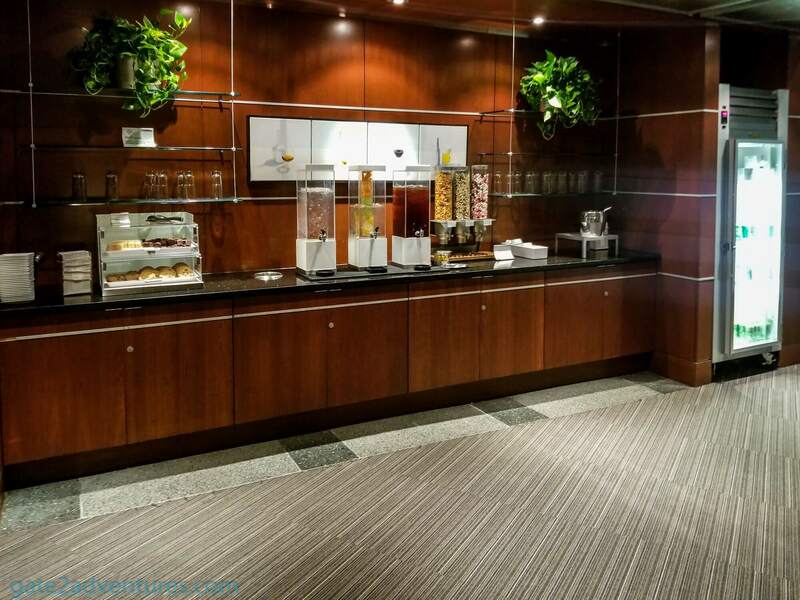 More information on the Admirals Club website. 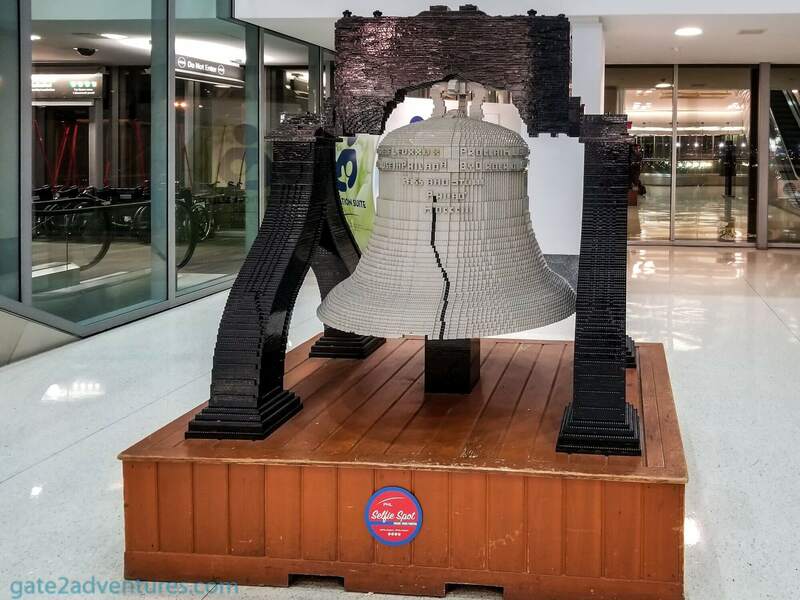 daily from 5 a.m. – 9:30 p.m.
Next to the elevator and escalator leading up to the Admirals Club is a Lego Replica of the Liberty Bell. The bell is an iconic symbol of the American independence and the original is located in the Liberty Bell Center in Philadelphia. I took the elevator up to the mezzanine level to the entrance of the lounge. It was already dark outside when I arrived here around 7 p.m. in December. Two agents were working the front desk and nobody else was around. 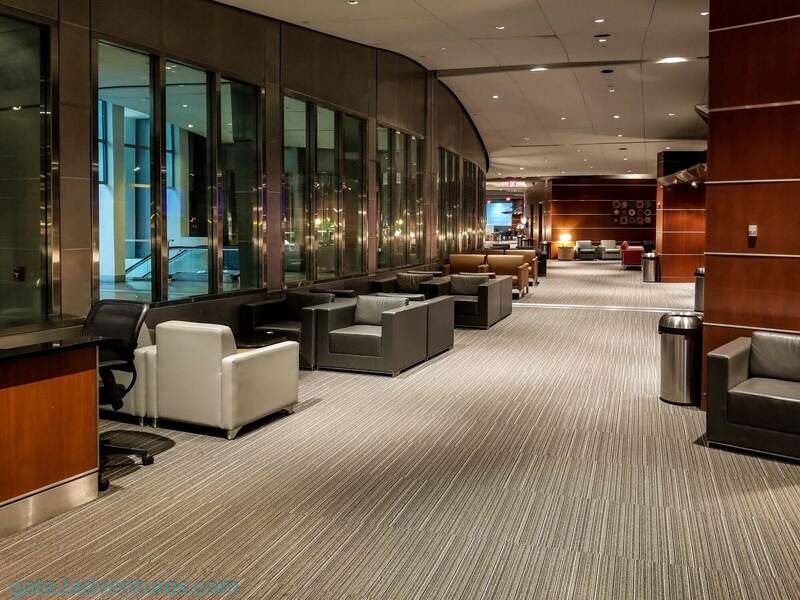 The lounge looked pretty deserted as I took a peak inside while I got checked in. 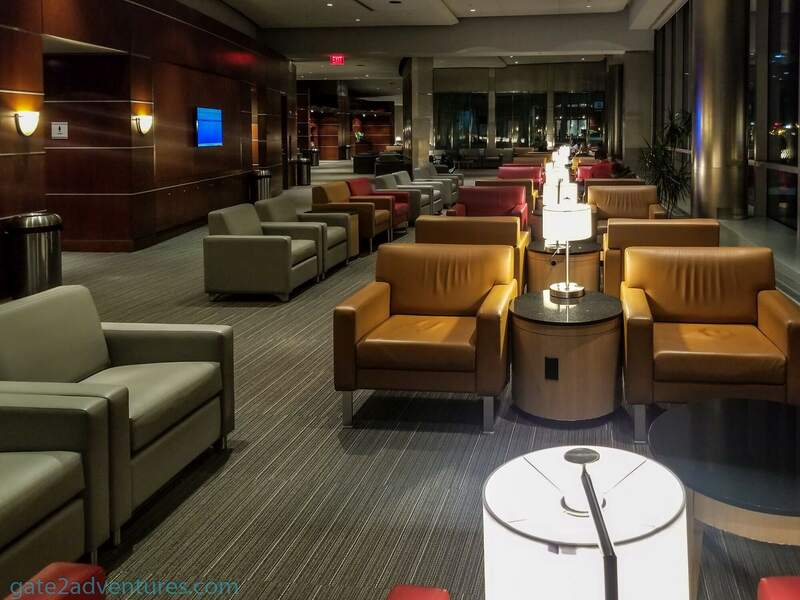 From the nice lady at the check-in counter, I got a quick verbal overview of the lounge and two vouchers for a premium drink or bottled water. Beer and wine are always complimentary in the lounge. The bar is towards the right from the entrance of the lounge. While there are plenty of comfortable chairs spread out all over the lounge, most of them only have a small table next to them to set down your snacks or drinks. I found an area, which looked more like a dining area, on the other end of the lounge and moved there, as I wanted to use my laptop. These tables are next to the floor to ceiling windows which run along the whole face of the lounge. Only a few tables have a power outlet located in the floor next to them. 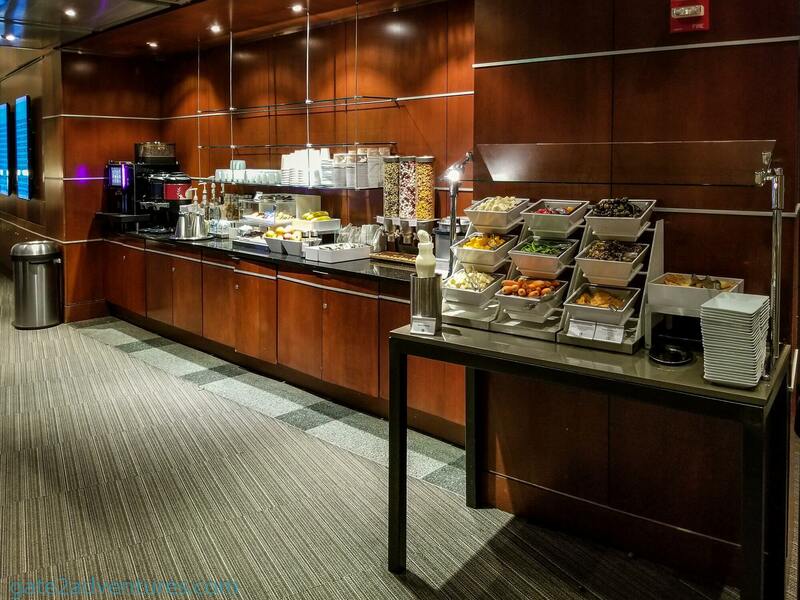 There is a snack bar right next to the dining area which offers light snacks like soups, cheese, carrots nuts, coffee, and soft drinks. 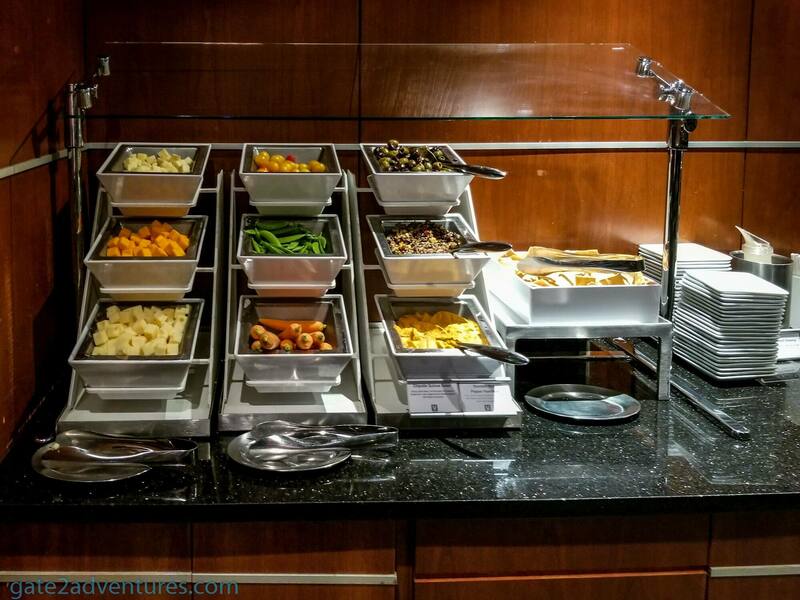 There is another snack area on the other side of the lounge near the bar. These are the only two places with for snacks. Inbetween is plenty of seating with TV monitors either showing news or Departure/Arrival information. 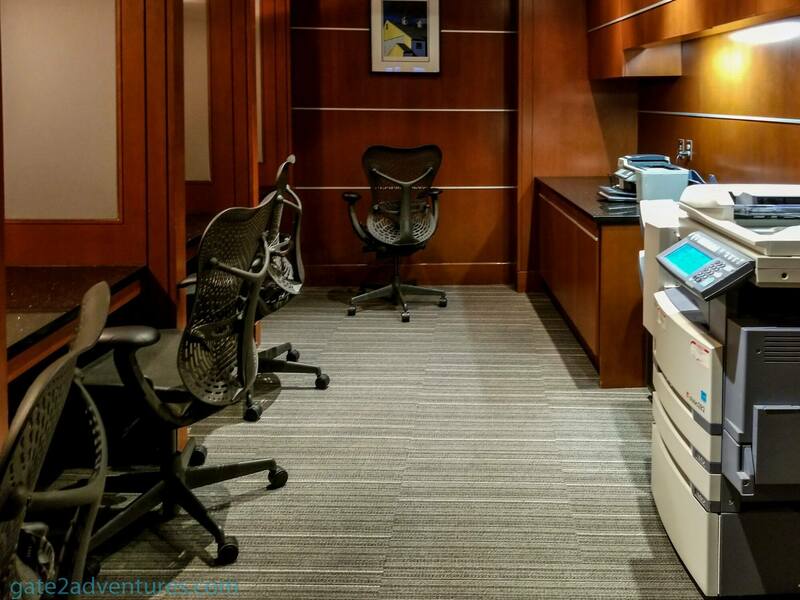 Either side of the lounge has a business center, with small cubicles and a printer-copier-fax machine combo. Toilets are also located on either side of the lounge and near the business centers. 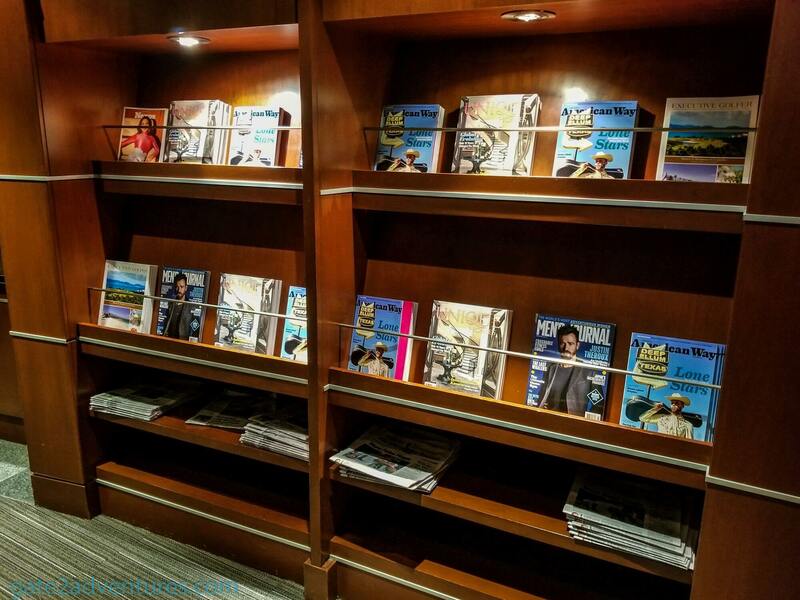 Along the wall, you can find multiple newspapers stands as well as departure and arrival information. Through the windows, you get a great view of the parked planes along Terminal A. From this place you see most of the international arrivals and departures. Announcements are made inside the lounge. 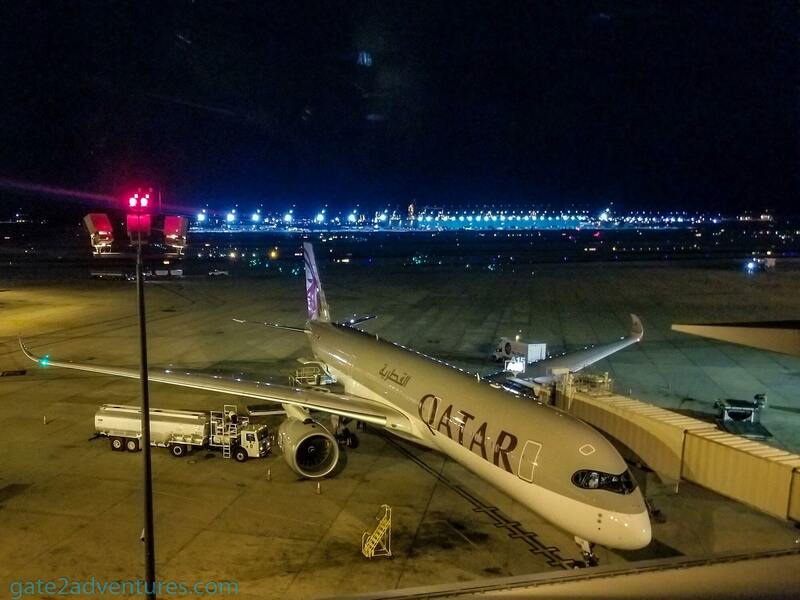 Usually, there are multiple announcements per flight but there was only one for the Qatar flight to Doha. Overall a great experience as the lounge was almost empty. The only thing which annoyed me was the coffee machine closest to me got a cleaning which got started by a staff member, which disappeared and left the machine in cleaning mode and unattended for like 20 minutes. Without being taken out of cleaning mode, I was not able to get a coffee.